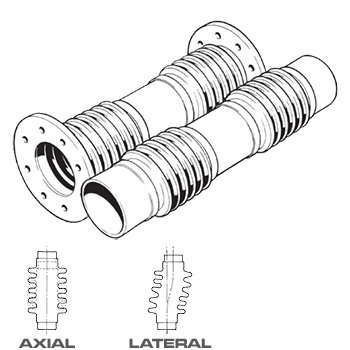 Two metal bellows elements connected with a pipe centre spool and fitted with fixed flanges, floating flanges or pipe weld ends for use in absorbing movements in pipelines. The joint has no movement restraining hardware attached. Internal flow liners can be fitted to assist with obtaining a smooth flow and to minimise friction losses. Suitable for either moderate Lateral (offset) or a combination of axial and lateral movements. This type of joint tends to be unstable at higher pressures and larger movements. Manufactured to the guidelines laid down in the Standards of the Expansion Joint Manufacturers Association Inc. (EJMA). All Contents � RADCOFLEX Australia Pty Ltd. All Rights Reserved.